As a person living in North America who loves soccer, and someone who is always excited by the amount of teams, leagues, and games each week taking place in Europe, college soccer can provide a version of a traditional pyramid league system. In Canada, 45 universities battle it out for each year for the CIS Championship, with a Vancouver Whitecaps alumni UBC Thunderbirds winning the championship in 2013. In America over 600 collegiate schools have men's soccer teams, including 172 who play in NCAA Division 1. 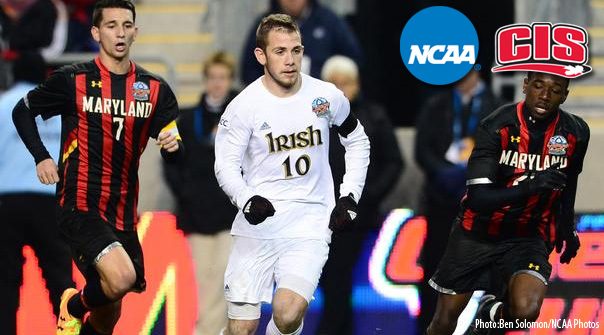 On Sunday, December 15, that season came to completion as Notre Dame took on Maryland at the Philadelphia Union home stadium PPL Park for the NCAA College Cup championship. To say it’s a big event would be an overstatement as the game gets very little coverage in American media. This is confirmed when even the lead article on Notre Dame’s website was about a women's basketball game and NCAA.com did have Notre Dame on the frontpage, but an article regarding the men's basketball team. The game was also broadcast on ESPNU - a channel most people don't get, including myself, so while the game was being played I was actually watching Atletico Madrid taking on Valencia and periodically looking at the live gamecast for updates. That being said, in terms of an MLS perspective, NCAA soccer plays a key aspect in player recruitment for the league. On average, each MLS draft, primarily based from NCAA athletes, brings in 50 new players in the league which is around 10% of the total players in the league and just under 50% of new players brought in by a club each season. An interesting stat this season, according to NCAA records, is 1,181,928 people attended NCAA Division 1 soccer games, including nine schools averaging over 2000 fans a game. You would expect bigger coverage for the Cup final, although like you would hear from any great music, movie, art or food critic, what should happen and what does happen are two very different things. The game itself featured two teams who were not ranked as the top teams in the end-of-season polls, but were two schools I thought could make it to the finals and certainly deserved to be there. I actually projected Maryland to be in the finals in my tournament preview, while I had Notre Dame losing to Georgetown in the regional finals, which never took place because despite having around 75% of possession Georgetown lost to Michigan State 1-0 in a third round upset. Pro prospect-wise, which a lot of my analysis is based on, both Maryland and Notre Dame provide a strong core of seniors and players who can make a name for themselves over the next four drafts. The game I actually watched on Sunday saw Athletico beat Valencia 3-0 where Diego Costa, a player I projected to have breakout season as part of my Spanish La Liga prospect list, scored another two goals. In contrast, on a cold afternoon with the weather just above freezing, Notre Dame scored their second goal in the 60th minute and were able to hold off Maryland for a 2-1 victory. They assisted by some debatable referring over a couple of handballs in the Irish 18 yard box that were not called. The game was typical American fair with both teams putting in a good effort and the stats showed Maryland certainly put pressure on the Irish, including 12 shots and being awarded 10 corner kicks. However, much credit has to go to Notre Dame’s coach Bobby Clark whose team only lost one game this season despite losing Dillon Powers and Ryan Finley in last years MLS draft. In terms of prospects, the match was always going to be about Maryland's, and 2014 top draft prospect, Patrick Mullins versus Notre Dame, and most likely a Chicago Fire homegrown player, Harrison Shipp. Both are seniors, team leaders and players who have had consistent college careers capped off by great senior seasons. Mullins opened the scoring from a rebound after Notre Dame got away with their first handball scoring his 19th goal this season, and in total he scored 46 goals and 23 assists in his Maryland career. Shipp assisted on the game winning goal from a free kick that was headed in by senior and local Philly product Andrew O'Malley, and by reports was the Man of the Match. He finished the 2013 season with 12 goals, 9 assists and 23 goals and 20 assists during his college career. The game told stories about other prospects as well, with Maryland's underclassman Schillo Tshuma touted as an almost guaranteed GA candidate earlier in the season hardly making an impact in his 62 minutes. Sunny Jane, another preseason draft prospect who raised questions when not invited to this season’s combine, only saw 5 minutes of action off the bench. Alternatively, Notre Dame seniors brought new light to themselves with keeper Patrick Wall and defender Grant Van de Casteele looking to solidify there draft potential, while the Irish goalscorers in the game O'Malley and Leon Brown might have added themselves as potential picks later in the draft. Leon Brown is a very interesting case because prior to the season he was in the top 50 Senior Prospects, but failed to make a large impact this season being used as a reserve starting only three games and contributing only 4 goals and 8 shots on target - not great totals from a forward. With the college season now complete attention is now placed solely on these and other prospects with the 2014 MLS Draft in less than a month. For me personally, who has been following senior players for the over 80 games during their college career, and also watches MLS closely, I do see potential in certain players establishing an MLS career. In the case of Shipp and Mullins I do have concerns since both players professionally would be either wingers or secondary strikers - a position not utilized well in the MLS. Comparing them to current MLS players if given the right opportunity, I could see them becoming like Chicago Fire players Mike Magee or Chris Rolfe, or they could struggle such as a Casey Townsend or Andrew Wiedeman in adapting to the pro game and finding playing time. The key, and part of the continuous growth of the league in its goal to improve its quality of play, is to fully understand the strength and weaknesses of all potential future players in MLS so that clubs draft with not only an awareness of the players’ skills, but also have an understanding on how they can best use them to achieve their full potential.